If your house were on fire and you could save just one item, what would it be? Many people would say “my photo albums.” But more and more photo albums are going digital these days. And it doesn’t take a fire to destroy all that data. Disk errors, power surges, or accidentally deleting the wrong folder—not to mention theft or vandalism—can wipe out years of irreplaceable photos. (Then there’s the risk that someday you might run out of room on your hard drive.) Your best defense against all of these catastrophes is a solid backup strategy. Formulating a reliable backup strategy takes a little thought. You need to consider four things: cost, capacity, convenience, and security. Cost You can keep your photos safe inexpensively, but the more you invest, the safer your photos will be and the easier they’ll be to retrieve when you want them. And in addition to money, any backup strategy will require at least a modest investment of your time. Capacity Image files take up a lot of space. So any backup strategy for photographs must give this factor plenty of weight. Even if you have relatively few photos today, your collection will probably grow. You’re going to want a strategy that’ll accommodate not only the photos you have now, but also the ones you’ll have in five years. 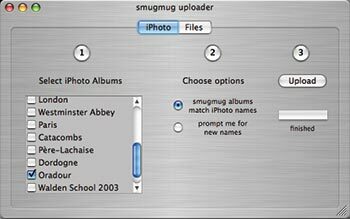 That Smug Look Smugmug’s software scans your iPhoto library and then lets you quickly and easily select albums for uploading. Security How long will your backups—or the media you’ve stored them on—last? And how easy are they to keep safe from prying eyes? If you’re using a physical medium, such as a removable disc or a portable hard drive, you can keep it in a safe place. Look for a media safe that’s UL rated, which means that it can protect computer media from heat. (If your house catches fire, discs will melt in a regular safe.) To be even safer, keep a second copy of your photo backups in another location—in your office or at a friend’s place, for instance (but never in your car!). After you’ve considered these four aspects of backing up your photos, you’re ready to look at some of your hardware and software alternatives. The first essential component of a backup system is the medium you use and the hardware it requires. You have many choices, each with its own pros and cons. Hard Drives Hard drives are great for general-purpose backups: they’re fast, capacious, and convenient. But they’re not as great for backing up photos. For one thing, the cost per gigabyte is far higher than it would be with, say, DVDs. Hard drives are also prone to failures that can imperil your data—especially over the long term. 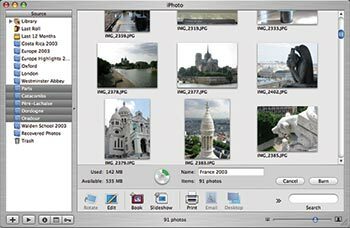 However, if you need rapid access to thousands of photos, or want to integrate your photo collection into a more comprehensive backup strategy, a hard drive (particularly an external FireWire model) can be ideal. You can say almost the same thing about using an iPod as a backup device: it’s fast and it holds a lot. If you already have a high-capacity iPod with some free space, it’s an inexpensive and readily accessible possibility. But if you don’t already own one, it’s an expensive way to go. And be careful: iPods are popular with thieves. Optical Drives (DVD or CD) Optical drives that write to recordable CDs or DVDs are convenient—most Macs have them built in—and require relatively inexpensive media. (You can find blank DVD-R discs for less than $1 each when you buy in quantities of 50 or more.) They’re also getting roomier: The newest dual-layer drives can store a whopping 8.5GB per disc (see our review of dual-layer DVD drives ). On the other hand, optical drives are comparatively slow, and despite early claims that CDs would last for decades, research has shown that the data on optical media can begin to degrade in just a few years. You can’t count on CDs or DVDs for long-term storage; to be safe, you should make (and test) a new copy of your backups at least every couple of years. Magneto-Optical Drives Magneto-Optical (or MO) drives use a disc that looks a bit like a CD in a protective case. These discs vary in capacity, currently maxing out at 9.1GB. New Ultra-Density Optical (UDO) MO drives increase that to 30GB per disc. Unfortunately, MO drives and discs are expensive, and write speeds are even slower than with CDs and DVDs. But MO discs have one big advantage: longevity. Some are rated to last 100 years. Of course, that’s in theory; they haven’t yet stood the test of time. But if you need the most reliable medium available and can afford it, MO is the way to go. Online Storage Services.Mac subscribers have 250MB of online storage space at their disposal (or 1GB, for an additional fee). Other services, such as BackJack and ( Tuloy offer more-sophisticated backup capabilities. But for backing up lots of photos, these services are less than ideal, because of storage limitations, high prices, or both. Several photo-sharing sites, however, offer terrific value and unlimited photo storage. 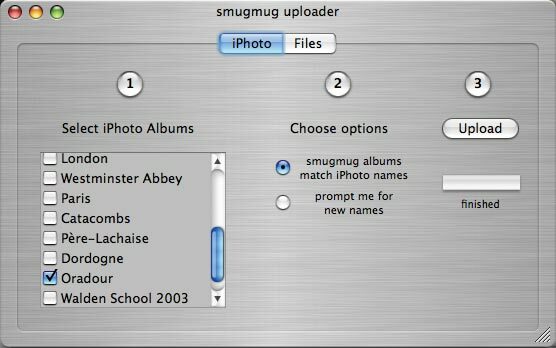 Two of the best choices for Mac users (because they integrate easily with iPhoto) are Smugmug ($30 per year) and the Kodak EasyShare Gallery (free with at least one annual purchase of prints or other products). In addition to storing your photos online, these services let you share them on the Web, order prints, and even get CD or DVD backups mailed to you. The low price and extra security of off-site storage make these services a valuable part of any digital photographer’s backup plan. But because you’re relying on your Internet connection (and the company remaining in business and online), it’s best to think of such services as supplements to local backups. For backing up photos, you generally don’t need all the bells and whistles of a full-blown backup app—in fact, you may already have all the software you need. But you should take some steps to make sure that you’ll be able to easily find and retrieve your photos when you need them. Burning Discs in iPhoto After you insert a blank CD or DVD, select the folders, albums, or photos you want to burn. iPhoto will display a dynamic indicator of the space available on the disc. iPhoto iPhoto can burn CDs or DVDs without any additional software. To use this feature, choose Share: Burn Disc and insert a blank CD or DVD. Select the folder(s), album(s), film roll(s), or photos you want to back up; an indicator at the bottom of the screen will display the used space and available space on the disc (see “Burning Discs in iPhoto”). When you’re ready, type in a descriptive name and click on Burn. That’s all there is to it. After iPhoto ejects the disc, reinsert it to verify its contents. I recommend making at least two copies of any backup and storing each in a different location. If you intend to delete the photos from iPhoto after burning the disc (to save space), consider making a catalog or contact sheet first (see “Keeping a Catalog”). Even though you’ve labeled a DVD “Jimmy’s Birthday,” you may later wonder which birthday that was, or whether you happened to include those photos of the dog doing tricks on that disc. 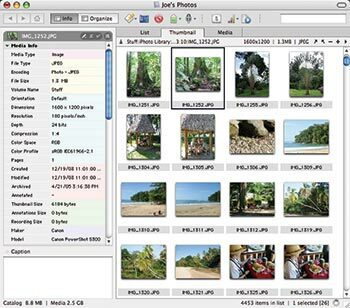 Third-Party Photo-Management Software If your needs exceed iPhoto’s capabilities, consider professional media-management tools such as the $160 iView MediaPro ( ) and the $200 Extensis Portfolio ( ). Both can automatically build catalogs of all your photos (including thumbnails), no matter where the originals are stored. If you use either program’s built-in backup features to move files to another volume, the program will automatically update its catalog to reflect the files’ new locations. This makes storing and searching a vast collection of offline photos easy. Both applications can also create contact sheets, among many other features. 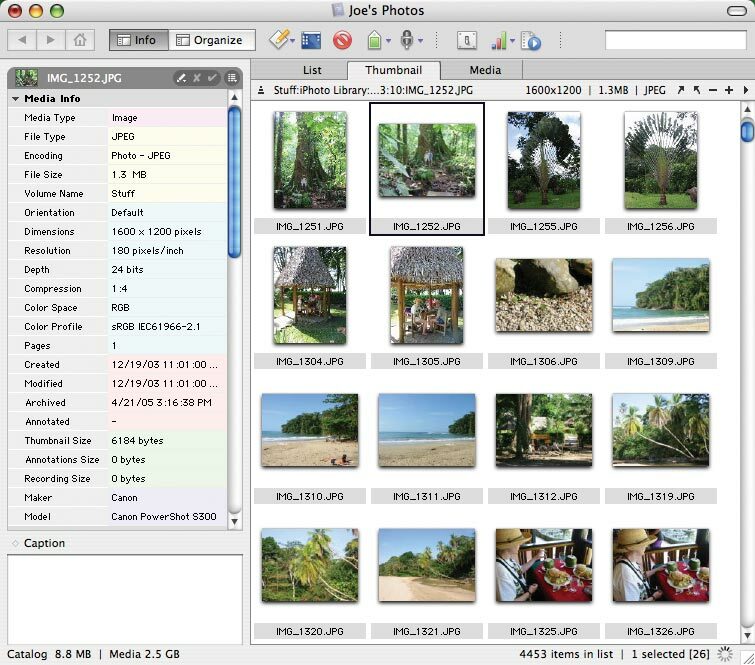 Photo Management for Pros iView MediaPro is a high-powered alternative to iPhoto. If you back up or move photos, it learns their new locations and keeps thumbnails available for easy searching. Not surprisingly, all these features make for a higher price and more complexity than iPhoto has. But if you have an extensive photo collection, you will likely find the investment worthwhile. Conventional Backup or Synchronization Software If you already have a conventional backup pro-gram, such as EMC Dantz’s $129 Retrospect ( ), or synchronization utility, such as Econ Technologies’ ChronoSync ($30), you can use it to back up your photos, too. However, these applications are best suited to backing up and restoring your entire photo collection at once: Finding and restoring particular photos from a backup can be challenging (see “Needle in a Haystack”). On the other hand, most backup and sync utilities offer the ability to schedule an operation, which can eliminate the risk that you’ll forget to back up your photos. Be sure your backup program adds new or changed files to an existing archive (without deleting older copies of the files). If your only backup is an exact duplicate of your files at a certain point in time, you could be in trouble if you discover that you accidentally changed or deleted a photo before your last backup. With this information, you can begin to devise a personal strategy. There’s no “one-size-fits-all” approach to backing up. You have to ask your-self: “What matters most to me? Cost? Capacity? Accessibility? Security?” Once you’ve prioritized those concerns, you can start to whittle down the possibilities. To help you do that, I’ve constructed three sample scenarios—“The Budget-Minded Amateur,” “The Anxious Parent,” and “The Professional Photographer”—that illustrate how three very different photographers could configure backup plans for their specific needs. You can pick the personality that’s closest to yours, and then tweak the backup plan as needed. A solid backup plan doesn’t have to be difficult, expensive, or time consuming. The hardest part is getting started. To get over that hump, just remember that your photos are worth it. Confused by all the different ways you can back up your photos? Here‘s how the major options compare for cost, capacity, convenience, and security.